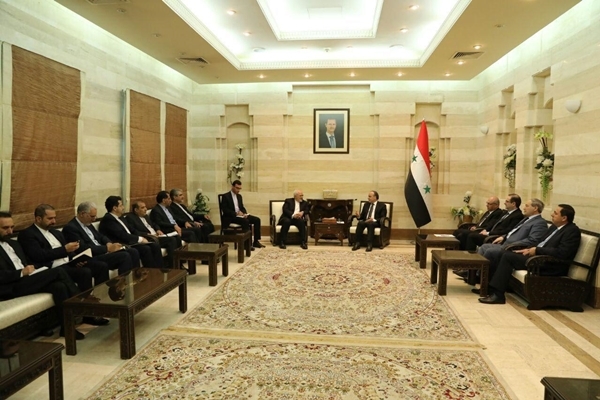 The top Syrian official made the remarks in a Tuesday meeting with Iranian Foreign Minister Mohammad Javad Zarif, during which the two sides exchanged views on mutual issues as well as regional developments. The Syrian prime minister welcomed the Iranian top diplomat and paid gratitude to the Iranian nation and government’s support for Syria. He also expressed sympathy with the families of the victims of the latest floods in Iran. Khamis described the Iranian foreign minister’s visit to Syria as significant and said the latest international developments require reinforcement of mutual ties between Iran and Syria. For his part, the Iranian foreign minister said Iran attaches significant importance to its ties with Syria. “We are happy to have stood behind you throughout the resistance and the issue will be recorded in the history of mutual ties between Iran and Syria,” he said. Today, he added, the Islamic Republic feels duty-bound to institutionalize the achievements gained at the price of the bloods of resistance martyrs in their fight against terrorist groups in Syria.